Gods’ Quest: The Shifters is an MMORTS game in which the player builds dominion in the kingdom and rule the kingdom by occupying the resource points, empty lands, and by recruiting the heroes, training the soldiers. Most of its mechanics are similar to other MMORTS games. If you are having trouble understanding the game’s mechanics, then our Gods’ Quest: The Shifters guide and Gods’ Quest: The Shifters tips, cheats & strategy will help you. In Gods’ Quest: The Shifters, you play as a lord of the city and your objective is to grow it by building and upgrading lots of useful facilities in the city. The game gifts you first dominion for free where you can build facilities such as barracks, farm, iron mine, sawmill, laboratory, market, temple, and many more. One of the main buildings in the dominion is the castle. Upgrading the castle will increase the strength of the castle wall and protect the resources from enemies. Resources are really important. You need these resources to drill army units, in building/upgrading, research, and many more tasks. When you start the game, the game shields the dominion with an active shield and enemies would not be able to attack your dominion. But as your level increases, the shield will get removed and the enemies will be able to attack the Dominion. The player produces gold in the market, food in the farm, wood in the sawmill, and iron in the iron mine. All these resources are stored in the storage and you need these resources in the development of the dominion. Apart from food/gold/wood/iron, the special resources include gem; fire gem, wind gem, earth gem, water gem, and light gem. You can obtain these gems from the Kingdom, by occupying the villages. Upgrading – Tap the building which you want to upgrade and hit the build button. You can build or upgrade up to two facilities at a time. Drilling the units cost you loads of resources. You can train or drill the army units in barracks, arsenal. Tap the barracks building/arsenal -> drill -> choose the unit -> confirm. Upgrade the barracks/arsenal to reduce the training time. Keep drilling the army units to continue running on the growth path. You can loot the resources from Kingdom stations and develop the Dominion. Go to the Kingdom and there you will find chasm points, Villages(Trading village, Mine village, Farming village, Logging Village, and more), enemy base, and more. Attack the chasm points to earn diamonds. Occupy the villages to earn resources over time. You can also earn gems from these villages. If the village is occupied by a lord, you must defeat his/her army to capture it. When you tap the village, the game will show you the overview. If it’s not, then tap the attack button and select a hero for the task. Once captured, the village will generate resources for you. Recon – Tap the recon button to send a hero there to scout/patrol. By scouting, you can check the details of the enemy, resources. You get the patrol report in the message option after sending the hero. On the kingdom map, you can also find a wealthy city. Capturing it yields you loads of resources every hour. You can select up to one hero for the attack. After tapping the attack button, check the box next to a hero to select him/her as a commander of your army. Tap the organize button and assign army units. You can train army units in the barracks, arsenal. 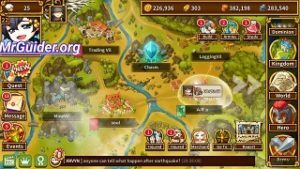 Heroes Guide – How To Get Heroes In Gods’ Quest: The Shifters? You can hire heroes from the temple facility. You can level up a hero by sending him/her on attacks(Chasm, villages, enemies) or by assigning them to the buildings at the base. After a certain level, the hero will automatically learn new talents. Laboratory – Unlock New Features! You can increase hero slots, unlock new buildings, and activate a variety of buffs by studying in the laboratory. Tap the laboratory -> basic/industry/military. Upgrade the laboratory to reduce the studying time. If it’s showing blocked, tap the blocked button -> under the requirement tab, you can check requirements to unlock it. So that’s all for now as Gods’ Quest: The Shifters guide. Let’s check out our top Gods’ Quest: The Shifters tips, cheats & strategy. Resources are really important and the core of the game. If you want to develop fast, then you should hunt the resources. Upgrade the farm, iron mine, sawmill, market or occupy the villages on the Kingdom map to fill up the storage. Additionally, you can activate production buffs by studying in the laboratory. You can assign the heroes to improve the facility performance. For example; assigning the heroes in farm facility can increase the production of food, assign heroes in the laboratory to reduce the studying time, in barracks to reduce training time. Even the game itself recommends you to focus on the quests to progress ina right way. Additionally, by completing the quests, you can earn loads of resources. At the bottom of the screen, tap the chat bar. On that screen, at the top-right corner, tap the get rewards button to claim free resources. Watch the video ad to claim the reward. Diamond is the premium in-game currency in Gods’ Quest: The Shifters game. You can use it to for instant upgrades, study, building, drilling, and more tasks. If you want to earn diamonds, destroy the chasm points on the Kingdom map. If you have occupied the villages, then make sure to protect them by recruiting mercs. Tap the Dominion button on the right side menu -> head to the villages tab -> manage -> recruit. Go to the kingdom map and tap on any nearby player’s base/dominion -> tap the trade button. You can earn gold by trading with neighbors. So these are the top Gods’ Quest: The Shifters tips for the beginners. If you have more tips, share with others in the comment section below.